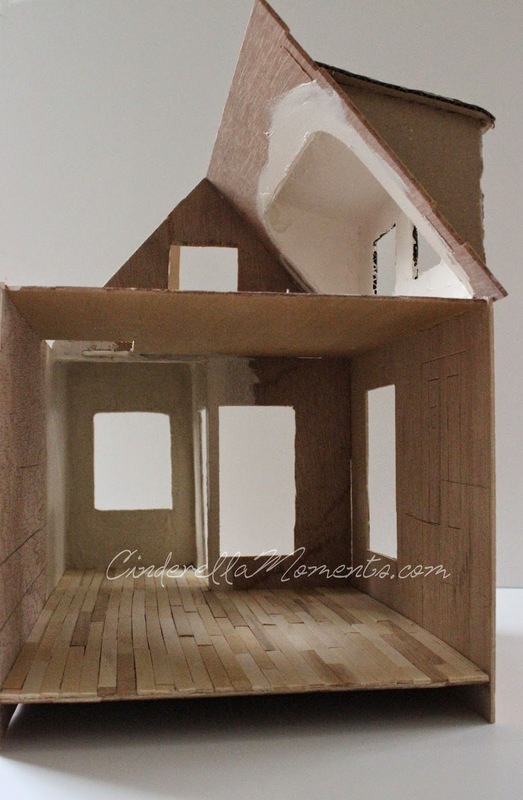 I have started a new dollhouse. I'm calling this one "Summer House." There's a little bump out foyer. It's given us a bit of a challenge because we didn't finish the walls before we put on the roof. Now I've decided to put book pages on the wall with the window and the wall with the door. Hopefully all will turn out wonderful. Or we'll try something else. Downstairs will be a kitchen and living room. Upstairs is the bedroom. And we've mocked up the upstairs gable with cardboard. I've made the mantel with a working fire. I made all the chandeliers already. There will be a sink and range in the kitchen. I made both of them with bass wood. I made a basket. I used string and wire. I don't know how other people get the weaving to stay in place. I covered mine with Modge Podge. Weird I know. But it worked. The ironing board is from Hobby Lobby. I painted it white, ripped off the top and made my own so it would be the entire length of the board. And I added a pink ruffle too. For the kitchen I made a round table and a stool. The chair is from Hobby Lobby. I made a plate drying rack. I'm in the Doll's House Magazine. The article is so beautifully written by Katie Holloway. This is a gorgeous magazine. Thank you Katie! 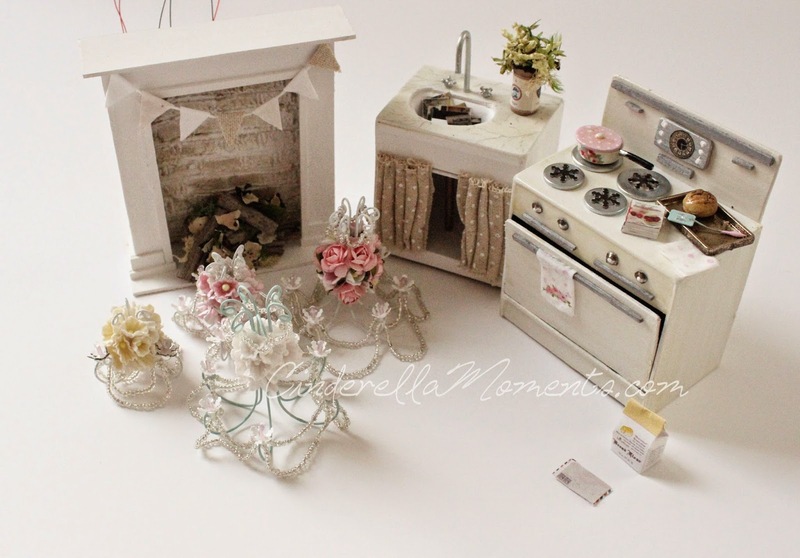 And I received a beautiful gift from Monica at Kitchen Miniature. She sent me amazing things!! Look at that tiny tin heart. It's so delicate. All those yummies look sooo good! Monica has incredible painting skills. 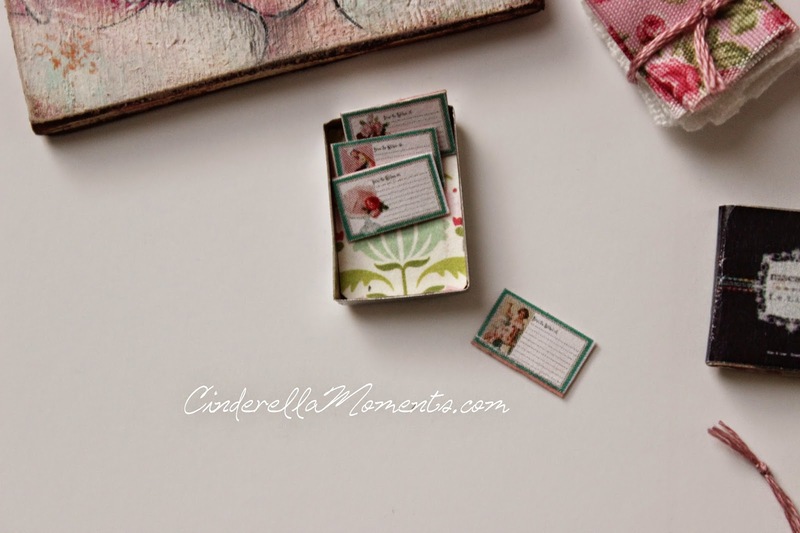 I love the little stack of fabrics. The cherry jam is one of my favorite things to put in kitchens. There's a little book too. And look at this! It's a painting of Lizzie! Monica has captured Lizzie's character perfectly in this portrait. I'm so impressed! And a bow! She loves it!! It's the perfect little bow. And she is actually keeping it on. Lizzie says thank you Monica! Gigie is also doing terrific. She has really big paws! 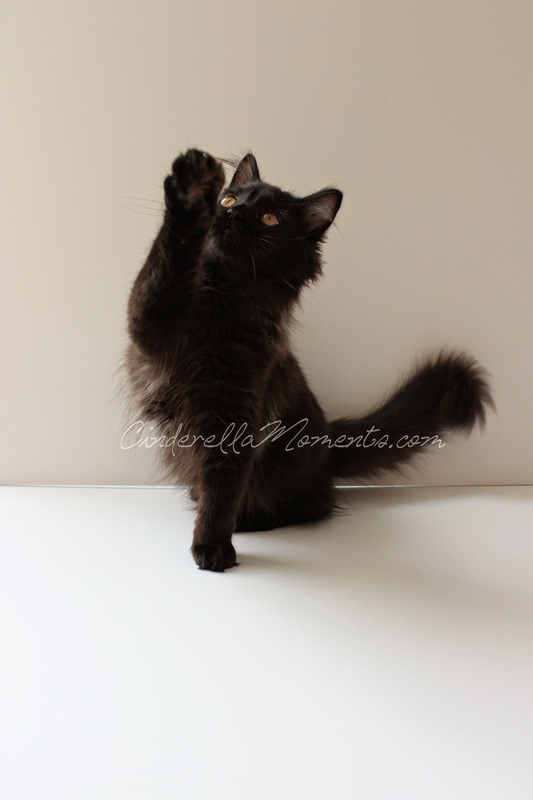 I wonder if she will be a big cat? Look they're sitting close together. Notice Lizzie's body language. That's too close for her! LOL! But Gigie does not take no for an answer. Also! My Facebook profile page has been changed to a business page. This was done by Facebook. So I've lost all my "friends" and cannot see your posts anymore. I will decide how to go forward from here. As it stands I have 2 pages and a new account profile. That's 3 different pages! Rrrrrrr! I'm going back to mini world. It's more fun there. LOL! No surprise at all that you are in the Dolls' House magazine. You are so incredibly talented & creative! 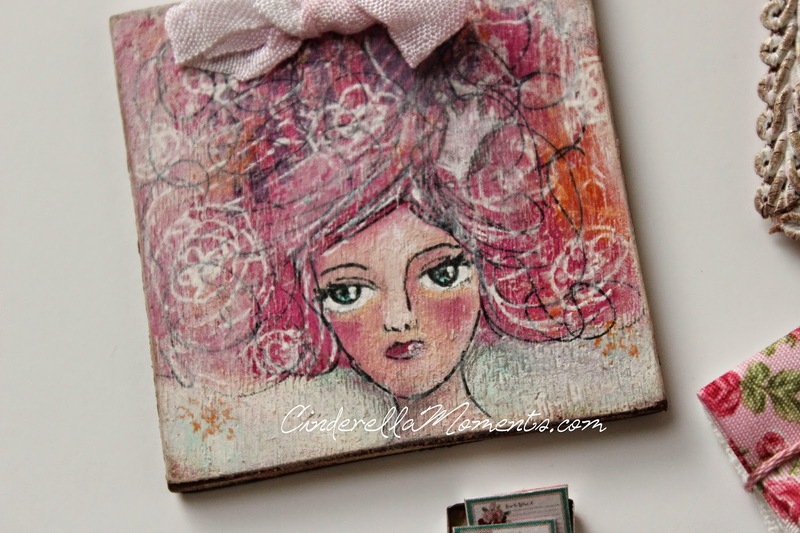 I love that so much of your creations are handmade from simple, inexpensive materials. It's what makes yours so charming & unique. They're not factory mass produced. Congratulations Caroline. You go girl! This house and its contents are looking gorgeous so far Caroline. I love the way you have done the little ironing board and I can't wait to see all those beautiful chandeliers in place. Congratulations on being in the magazine. I will have to try and obtain a copy. The gifts from Monica are lovely, especially the little picture of Lizzie. I love the photo of Lizzie and Gigie. They are pretty close. Perhaps soon they will be that close without the tense body language from Lizzie. These things take time. Both of them are adorable. wow! that good that publication, congratulations, it's great! I love everything you've done! They are so cool! I love it ... I love it !!. thanks for the post, Lissy looks gorgeous with your new tie, the next time I send a gift to Gigie too. 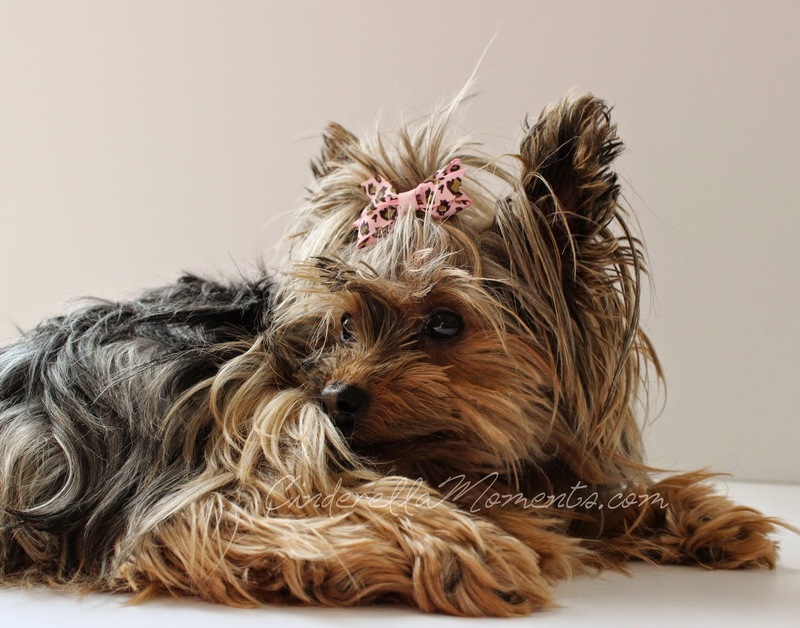 that little Yorkie has me in love, is so sweet .... I'm glad you like my gifts, you all you deserve. Your summer house is going to be amazing! 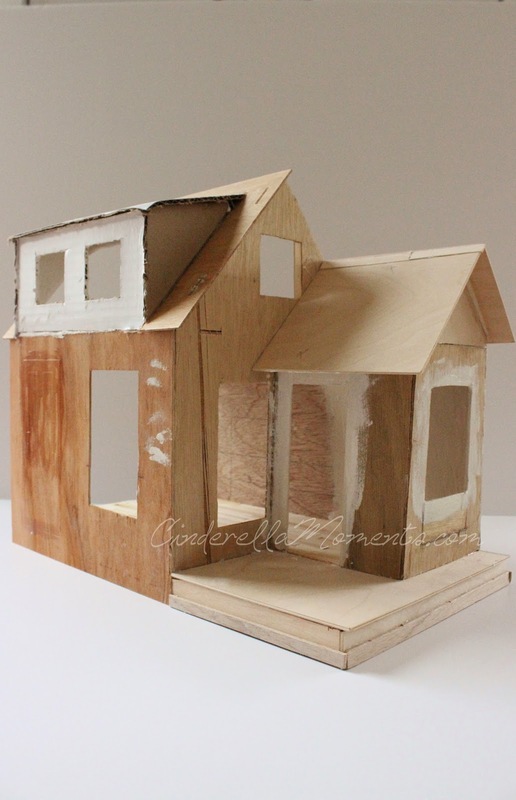 I love the pop out gable upstairs, so cute! You must have really steady hands, I barely touch something and knock everything else down. How do you find all these awesome things at Hobby Lobby? Ours only has a very small section of dollhouse furniture in the very back. The goodies you received are so precious. I loooove your chandelier's, they're so beautiful!!! Lizzie looks beautiful with her bow on, too funny how she's turned away from Gigie:) So precious. I've always had huge admiration for your talent but, I have to say, since starting my humble little dollhouse, my admiration for you has grown about 1000 times! The patience and creativity you have blows my mind, you are so talented!!! Hi Caroline! 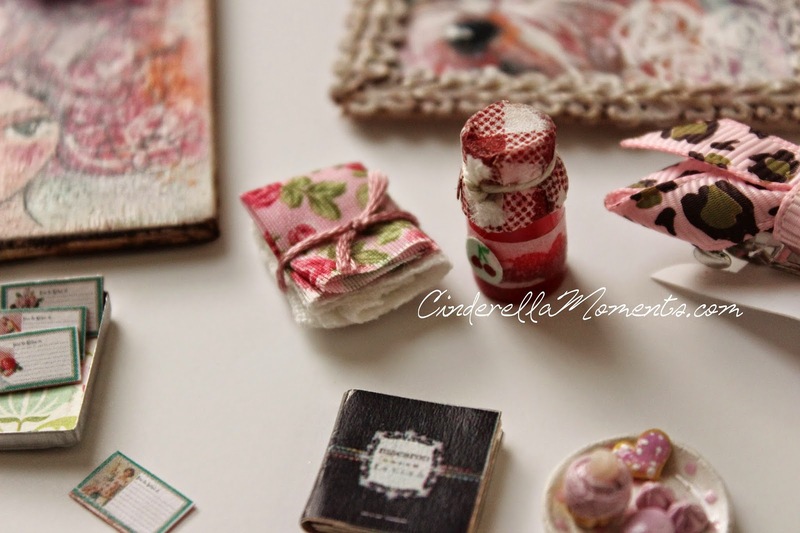 Congratulations on being published in The Dollshouse Magazine, Caroline, your work is worth it :D! 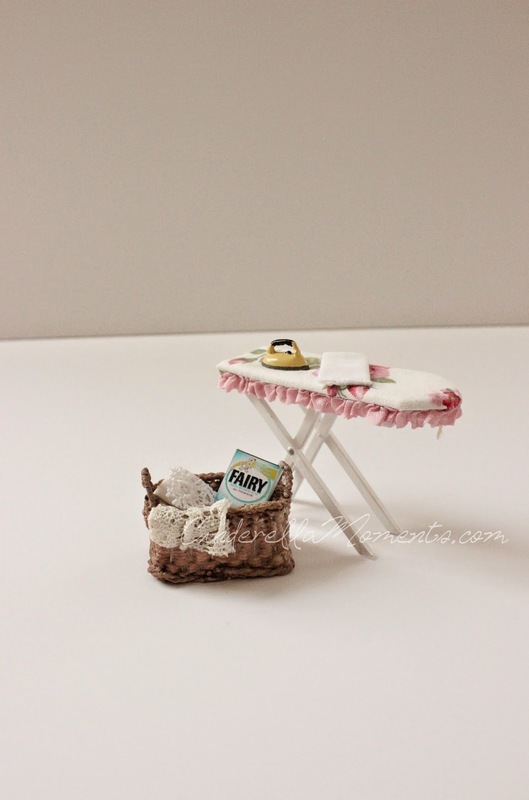 This new dollshouse is very promising, it will look fabulous as all what you do :)! So sweet of Monica to sent you these gifts, enjoy it all. 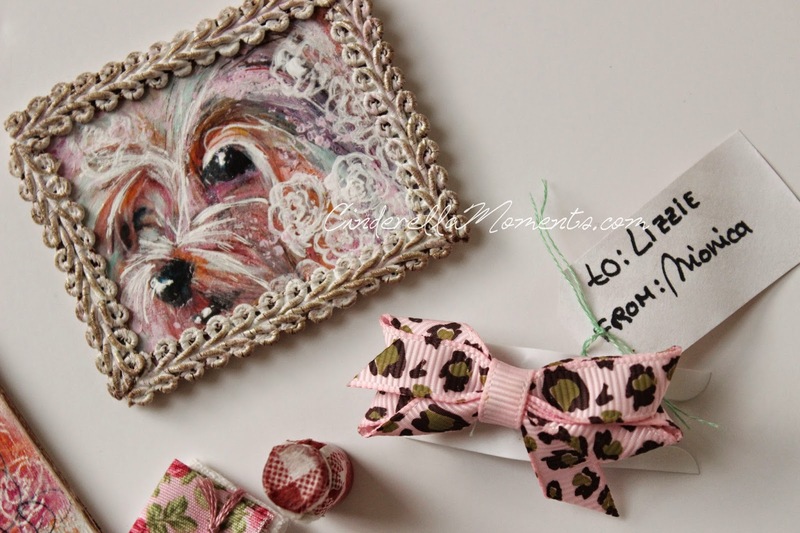 I especially love the gorgeous painting of Lizzie and what to say of the cute bow for her. The picture of her and Gigie......is gold:her body language is really like 'No I'm not intereseted', but.....:D! Awesome picture of both your little rascals and sweethearts, Caroline :)! Caramba!!! Esto sí es una entraa triunfal! Jaaaa! Preciosa la casita, como todas las que haces :) y felicidades por la publicación y los regalitos. :) Un beso! 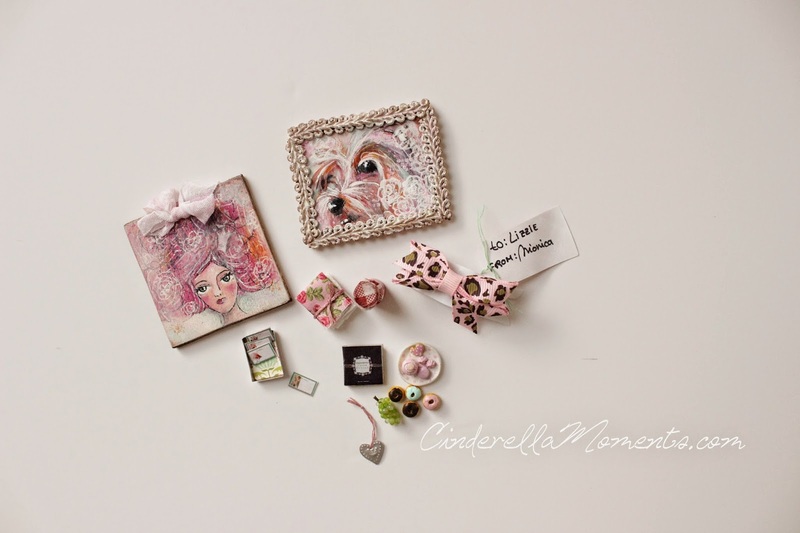 Of course you are in Dollhouse Mag... You are one of the most talented people I know in miniatures. I love your work. The cottage is fabulous and deserves its print. The interior shots are so light and airy, so well done! You got some wonderful goodies, very handy for lovely scenes! Estoy deseando ver esa casa de verano terminada. Todos los detalles que has hecho hasta ahora son preciosos y quedará genial. Los regalos son muy bonitos y Lizzie y Gigie son tan guapos y graciosos. Felicidades por la publicación. La nueva casa tiene también una preciosa estructura. Has hecho unas preciosas cosa y te han hecho unos maravillosos regalos. 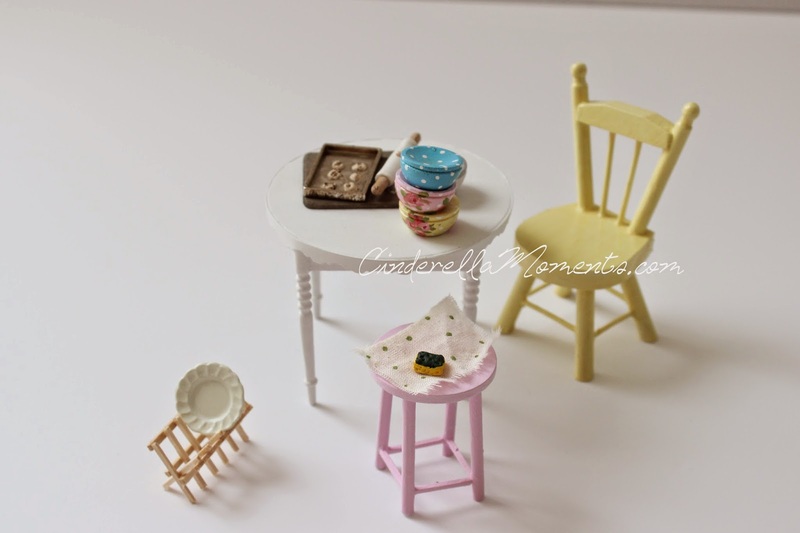 l couldn't wait to pop back after my last visit to see what you've been up to and of course you've been as busy as a bee since then:-) Love the form of the new dollhouse and the book page walls will look fabulous. l love Monica's painting of Lizzie, what an awesome likenesss. Hope you have a fabulous weekend. Muchísimas felicidades por tan merecida publicación,todas y cada una de tus casas merecen ser vistas en la revista!!! Tu nueva casa se ve preciosa y no puedo esperar a ver todas esas maravillosas minis que has creado para ella en su lugar!!!!! Congratulations on all the gorgeous gifts from Monica. The paintings are beautiful. I saw your article on the magazine as soon as I opened the page I knew it was yours your houses are so gorgeous and special. Wonderful article congratulations. 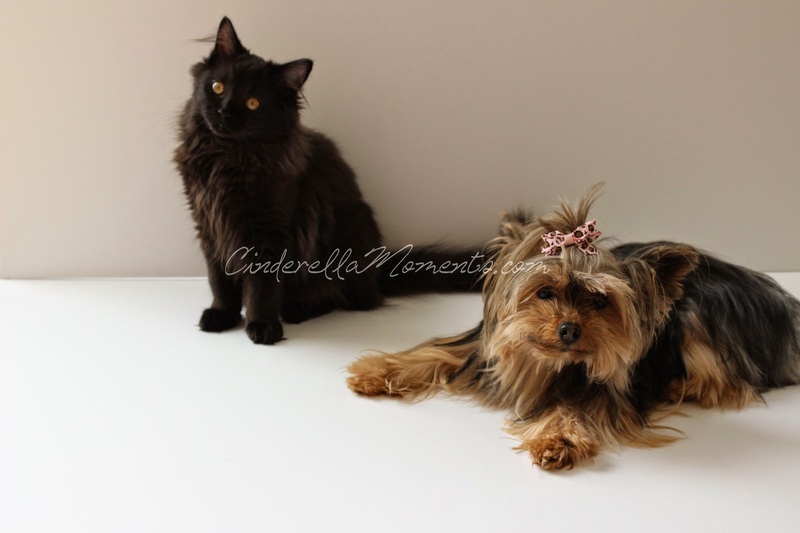 Adorable pictures of your pets. Hi Caroline, Congratulations on being published again,you realy deserve it! The new house looks very interesting with its unusual shape and you already made some adorable items for the house. Congrats on the new article! Awesome! The new project is amazing. I like the furniture and accessoires. Thank you so much for my lovely birthday wishes, I really appreciated it. Anyway, I saw your article and I knew straight away this was one of your houses! You have a distinct style :) I have also just read the Dollshouse World Magazine....and I love, love, love the Butterfly house and the article is superb! It is only right and fitting that a true artisan is acknowledged! 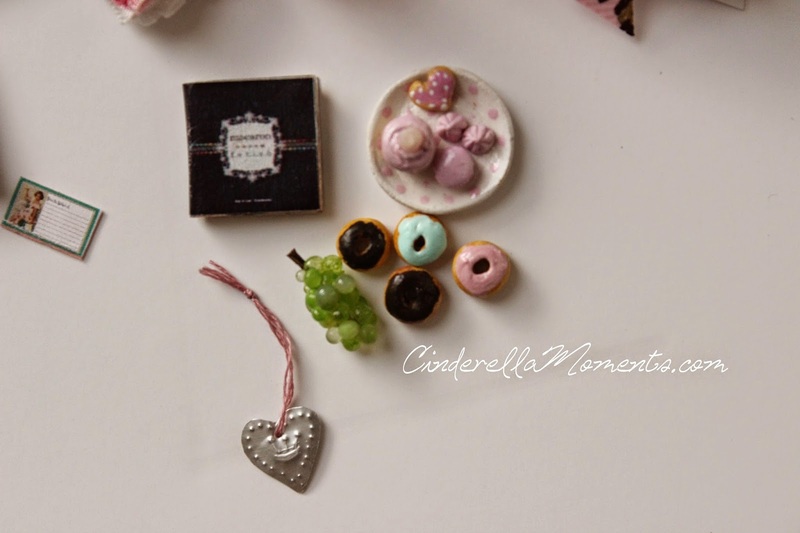 Many good wishes for the future for Cinderella Moments!